The plane took us first to Minneapolis, then a long diagonal down to Tucson. I noticed we cut an oblique angle to the snow covered Continental Divide in Colorado and the path I'll eventually hike. I tried looking for the west and middle forks of the Gila River but it would be easy to mix them up with the spaghetti pile of rivers and canyons in New Mexico. Our packs made it through to Tucson and Mike - yet another amazing person - a friend of PCT friend Cinco who you may remember from my blog posts in Oregon and Washington, picked us up at the airport to start the 2 hour drive to Montezuma Pass - the closest (dirt) road to the AZT southern terminus on the Mexican border. We had some excellent Mexican food served from the insides of a former gas station on the way down, filled up 4 liters of water and pulled up to the pass around 4 pm. The views on the way were stark contrasts to the multiple feet of snow still precipitously piled in Boston, the endless horse farms and suburbs of my parents house and the circular confines of air travel. It was also fun to reminisce about the PCT with Mike since we both hiked in 2013 but probably stayed less than a week apart the whole trail. He finished September 17th and started April 22nd (I think) and I finished September 20th and started May 2nd! Anyhow, Rachel and I were excited to get going on the 1.6 mile downhill hike to the border from Montezuma Pass and rushed to arrange our packs and get hiking before we lost more daylight. We said our goodbyes and hit the trail, passing border patrol agents hidden away in some kind of giant seeing eye trailer. The trail down to the border was steep and rocky but the views were excellent. I always find our countries borders amusing since they're so debated but in reality just a barbed wire fence. We turned around to officially start the AZT at 5 pm, with 4,000 feet of elevation gain ahead of us and 8 miles before the first water source - a bathtub. We slogged uphill lugging 5 days of food and 4+ liters of water for two more hours, making it to around mile 4 before calling it a night and setting up my square cuben fiber tarp on a windy ridge. After dinner and just as we were settling into the first night we heard huffing and puffing and saw a headlamp. Was it a border patrol agent that had seen our lights in the dark from the valley below, or an immigrant from Mexico making a break for it? Turned out to be our first thru-hiker! Mr. Furious (PCT 2011, 1000 CDT miles last year) had started an hour after us and was planning on getting to the next town in half our allotted time. He settled in down the ridge from us and we got to talking the next morning. Rachel and I slept in and were still eating breakfast when he was leaving, don't think we'll see him again. The next days hike was beautiful, the scenery is totally different from the PCT. Huge open views of Arizona's Sky Islands - small mountain ranges separated by arroyo's, doughy folds in the earth, and vast desert planes rise up again and again far into the distance. The view into Mexico is even more stunning and the lack of city lights is a stark contrast at night. We got to our first water source - a spring fed bathtub the next morning after passing trash left by migrants or filthy hikers and after taking a side trip up to Mt. Miller at about 9400 feet. This is the first of several "optional" peaks that seem silly to skip. We were both feeling the elevation but only as a loss of breath and no signs of acute mountain sickness. Rachel already had blisters on her heels! We kept moving, another 8 miles that day past the tub and through the Mt. Miller Wilderness down into a shallow canyon on dirt roads. There was plenty of water, even in unlisted sources. The source we stopped near, called a seasonal pool, was a running creek! Just as we made camp early, around 4 pm, the sky clouded over. I debated setting up the tarp, reminiscing about cowboy camping on the PCT, but got over it when I felt a drop. A good thing too since it poured for a few minutes before quieting down. We spent the afternoon trying different solutions for Rachel's blisters and figuring out why her knees were hurting. The next day we hiked on and off single track and old washboard dirt roads. The rain would start, putter out and then start up again. Still, the views were stunning and made more interesting by the cascades of rain off in the distance. We finished Passage 1 (there are 43 passages on the AZT) and started Passage 2 - the Canelo Hills East. Each passage has a kind of notable feature, this and the next are the arroyo's - hills and steep valleys that gather water. We would hike up and down them in and out of the drizzle all day. Towards the end of the day it really poured and my umbrella got some good use but I left my wind breaker on the outside of my pack where it got drenched. Rachel's rain jacket (no umbrella for her...yet) soaked through and she started to shiver. 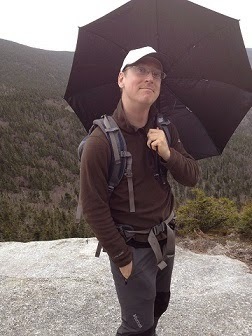 I was starting to shiver too and knew it was silly to keep hiking. We set up camp at the first break in the rain in an area littered with now wet cow pies. There have been a lot on the trail but only a handful of cattle. We had plenty of water from a running stream in the last canyon and as soon as we got in our shelters the sky opened up and stayed open until around midnight. The next day we kept on pushing through on and off showers with wet feet. The trail was a mix of rocky single track, muddy dirt roads and dirt roads covered in jagged rocks. As soon as we though the sun would come out and we could dry our socks and tarps the drizzle would start again, sometimes with thunder. Again in the afternoon it started to pour but we huddled together under my umbrella instead of hiking and getting soaked again. This was not the Arizona I was expecting! Once the rain slacked off we hit the trail again with even better views of distant mountains an plains. Towards the end of the day we entered a narrow canyon, listed as having a spring 0.1 miles west but overflowing with water. A few tenths of a mile later the stream disappeared into the sand and we made a poor choice to camp at the end of the canyon where it was windy, cold and full of condensation. Hindsight is 20/20. Today we made the last 8 miles to Patagonia (Arizona - not South America) in the warm sun, hung out in town and got our first hotel room. We'll probably take all or most of tomorrow off and start the climb up Mt. Wrightson in Passage 4 on Sunday. Better to rest and let blisters heel (I have two hot spots from wet feet) than push hard too early. I know you're all wanting photos but rather than spend hours trying to fiddle with this blog to upload them I'll just be posting links to my google drive with each post and you all can check them out! I'm playing with the HDR setting on my camera as well so there are multiples of a lot of shots. Also it's Friday night and the upload speed at the hotel is really slow, so they won't all be there until Saturday afternoon (3/21). I'll set a few up on the facebook eventually too but they get really compressed on there, this way you'll get them in their full glory. Check out the photos on my google drive here! Haha forgot to mention I left them in Mikes truck! I'm drinking the koolaid on umbrellas. Ordering one today. Haha, another conversion to the umbrella religion!